Moving away from home to attend college should be an exciting phase in search of independence. But getting organized to face this challenge could often times be overwhelming, especially for new aspirants. 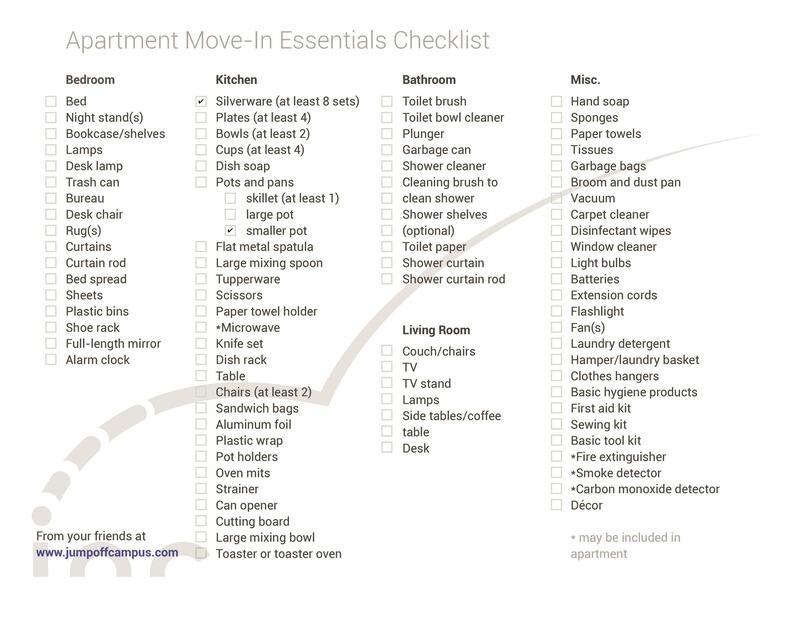 It would always be helpful to obtain an apartment checklist that would enumerate all your college necessities which usually includes items like desk lamps, bed sheets, and pillows, to dorm appropriate cookware. Surf the net, Google for shops that could provide you product information to complete your checklist. From there, you can leisurely do your shopping in-store or online. Moving away from home and preparing for college life could be an interesting experience. A sense of independence and responsibility goes along this moving out. You have done your checklist. You have a new home. You sit on a newly bought chair and savor that sense of accomplishment. Then you feel your stomach grumble. You are hungry. You have food in the fridge. And then it hits you, there are no spoons and plates. And an aftermath to a meal, there are no sponges and dishwashing liquids. Later you would find out, you have no mouthwash and toothpaste. This is just a simple predicament that demonstrates the importance of trivial items which are often taken for granted. 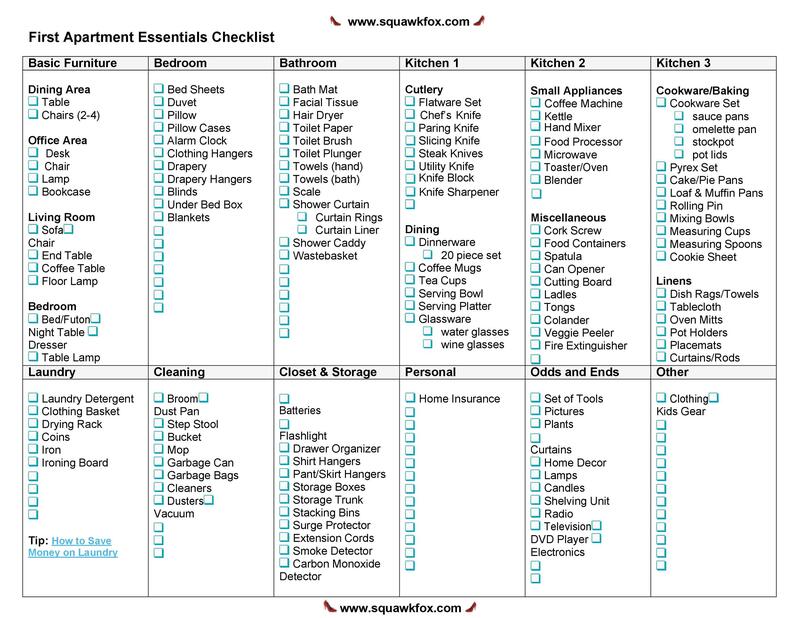 Your checklist didn’t fail you, it is just impossible to think of all the necessities in one sitting. 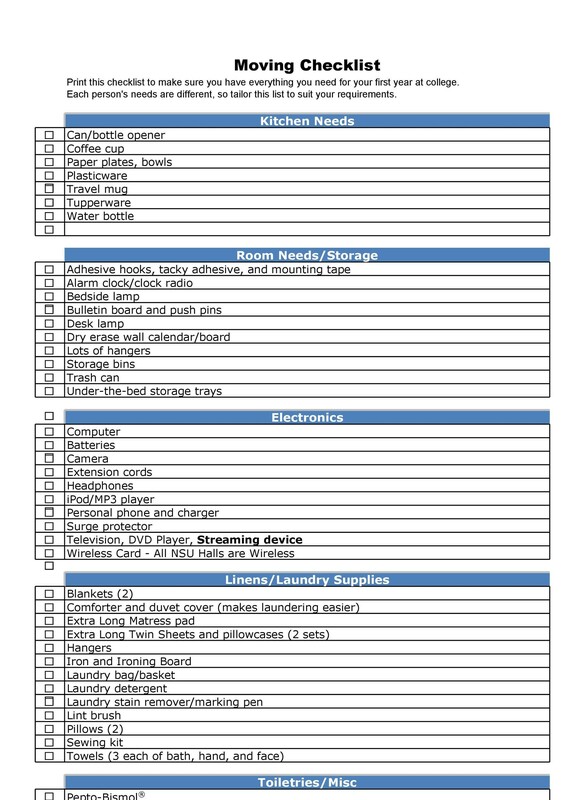 To avoid such overlook, improve your original moving checklist, make it more comprehensible with all the things you need to be organized by room function. 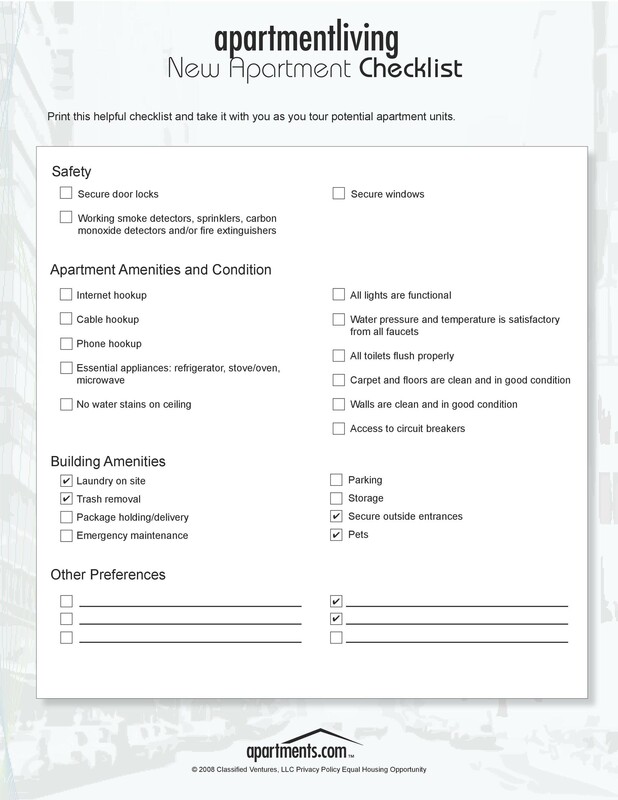 When making an apartment checklist, you will have to think about all the areas in the home and all the items which go into them. 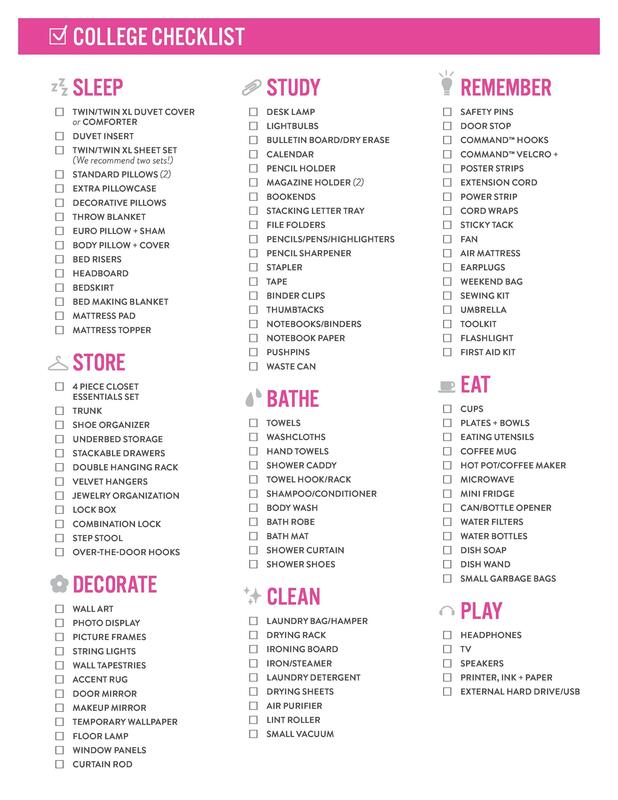 You will include all these items in your list so that when you’re searching for your new apartment, you won’t miss out on anything. How to provide for your kitchen will always depend on your eating habits. The kitchen of your new flat is utmost, under-equipped. If you intend to socialize a lot, provide for extra wares like plates, spoons, forks, cooking utensils, etc. If not, minimize. Also, take into account convenience. Disposables are a great help. Saves time and cleaning efforts. Also provide for disinfecting items to keep surfaces clean and sanitary. Most consider this room as the most important space in the house. Although it is where you conduct your dirty business, so to speak, make it a point to always keep it clean and be precautious on what its constant needs. 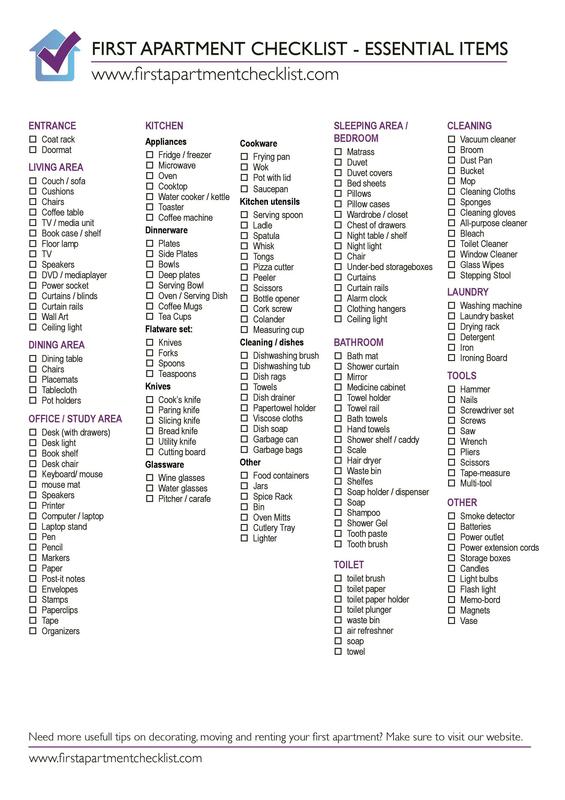 If possible, stock the bathrooms’ needs on toiletries like paper, tile and bowl cleaners. On the personal side, always have an ample supply of bath soap, body wash, and toothpaste. Bathroom refreshers are also noteworthy. Keep in mind that guests will always remember you depending on how you maintain this all-important room. Your living room should be simple. Do not clutter it with unnecessary or novelty items. Provide ample lighting, a table lamp on a side table, a comfortable sofa with trough pillows, a center table and if possible, spoil yourself with a TV set. Books and magazines could make for great decors and source of information. Maybe a flowered vase would add some accent. Always keep the floors clean. Vacuum and polish regularly. Again air fresheners are great. Always keep a number of bed sheets and pillowcases on hand. One side table would be needed for your watch, eyeglasses and items you take off before sleep. For your personal use, don’t forget your slippers, pajamas, and robe. Again, an emphasis on the importance of air freshener. There is really no need to buy all those furnishings brand new, especially for freshmen students. Call for friends, your parents, your relatives and ask them if they can spare some stuff for your new realm. Or better yet, go to high-end garage sales. You can pick up great and expensive items at the lowest costs. It doesn’t matter if these do not match. Just a collection of these second-hand eclectic items for your “new” apartment would already give you a sense of accomplishments. In one of your kitchen drawers or maybe in a designated storage area, always have a place to stock your cleaning needs. 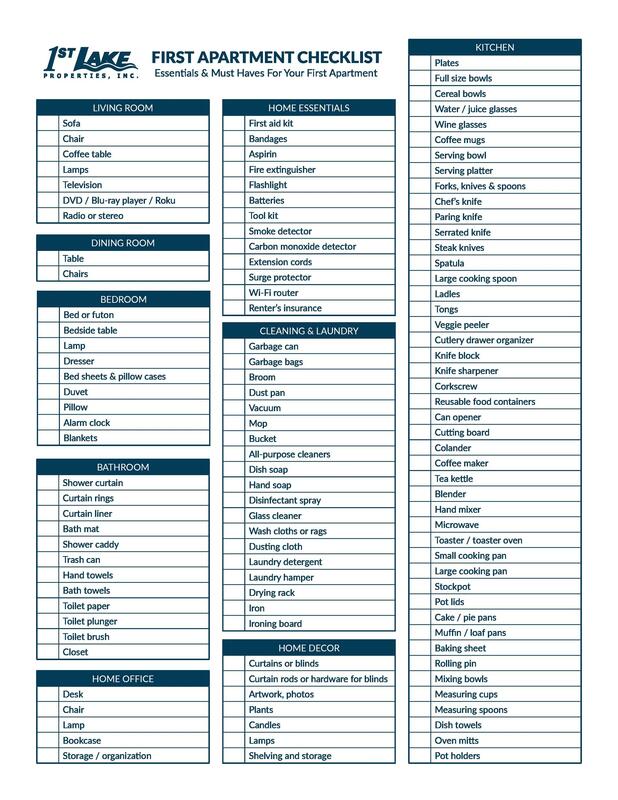 Keep track of cleaning aids so as not to fall short on them. Dishwashing liquids, scrub mats, polishing agents, laundry needs, air fresheners, etc. Keep them away from food supplies and away from electrical sources as some of them may be flammable. Other items may also be acquired but not a prime necessity. But bear in mind that we are talking about starters. Vacuum cleaners and microwave ovens could be useful. But they can come later. Washing machines and dryers are usually provided for by the landlord but in case they are not, go find a laundry mat. 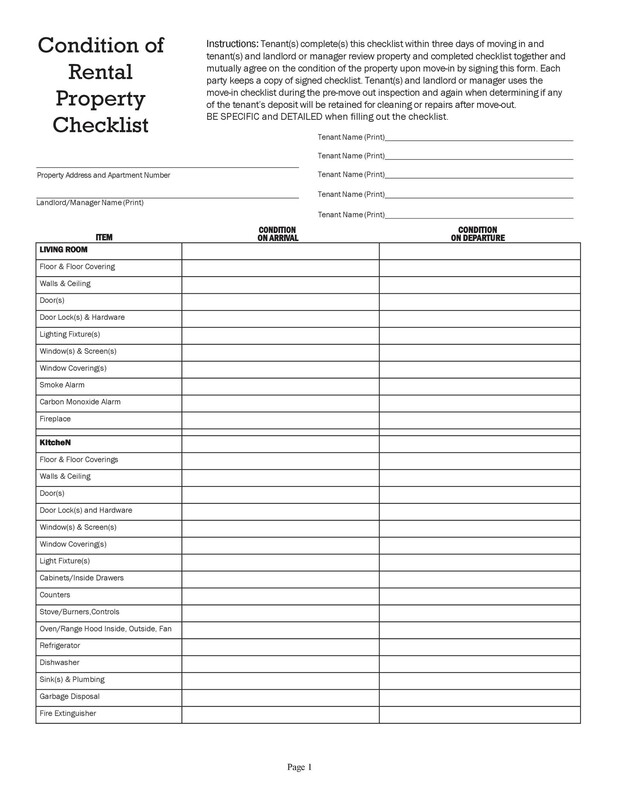 We have emphasized here the importance of a checklist when intending to acquire your first home away from home. 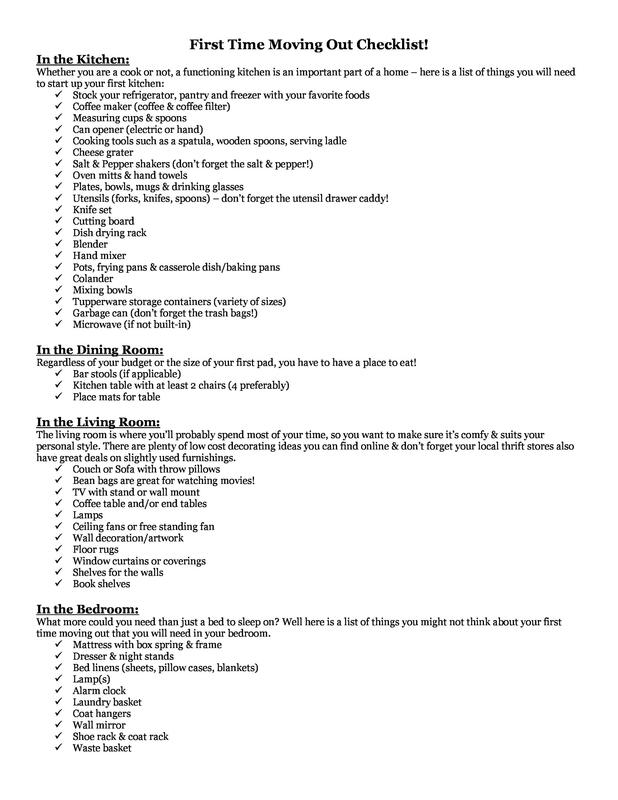 And making a comprehensive list organized by room can further avoid the occurrence of deficiencies. Like in every process, the beginning is always the most apprehensive and sometimes, terrifying. 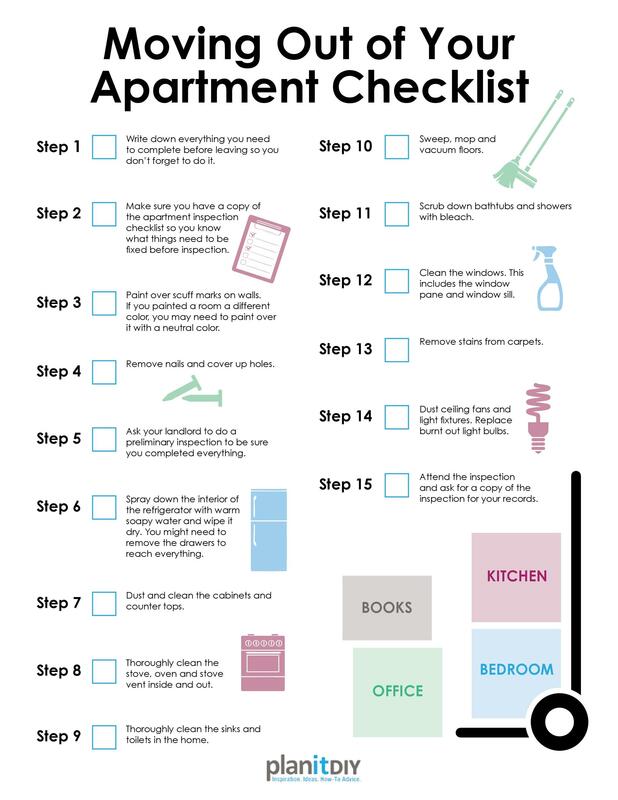 Whether you’re a professional finding your first apartment or a student moving out for the first time. Although freshmen have lived all their lives using basic goods every day, they really never had the chance to buy them. 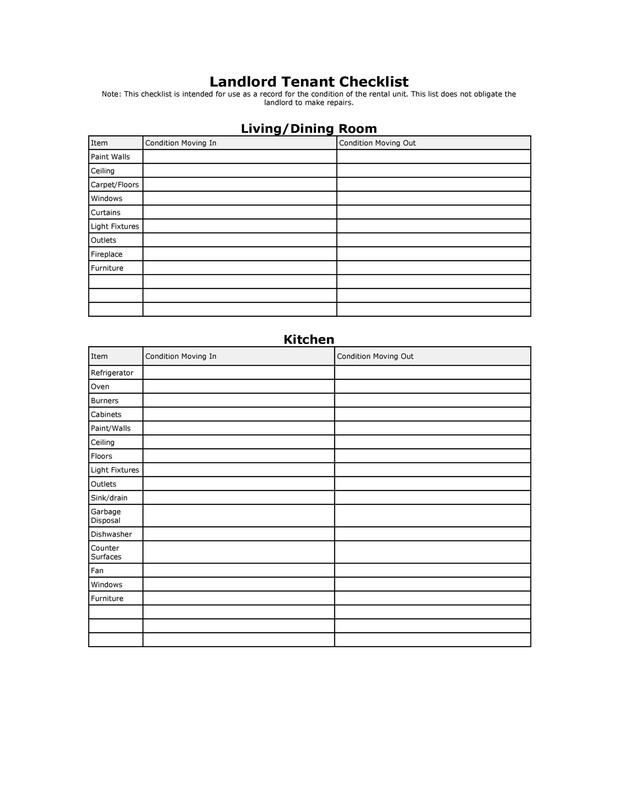 Purchasing items like towels, plates, kitchen utensils and etc. are all new. 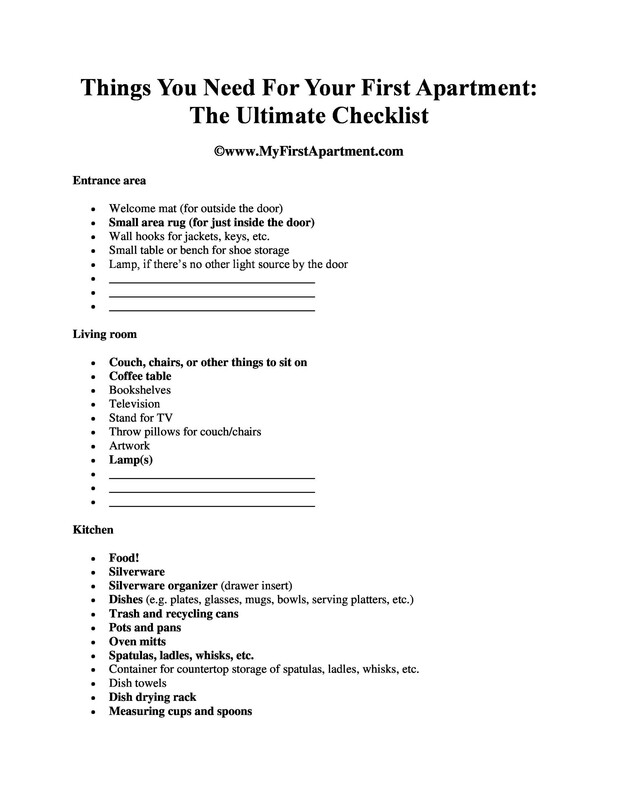 Once you have a checklist, print in out and decide on what would prove appropriate for your apartment. As you will discover, the list is meant for a general audience. 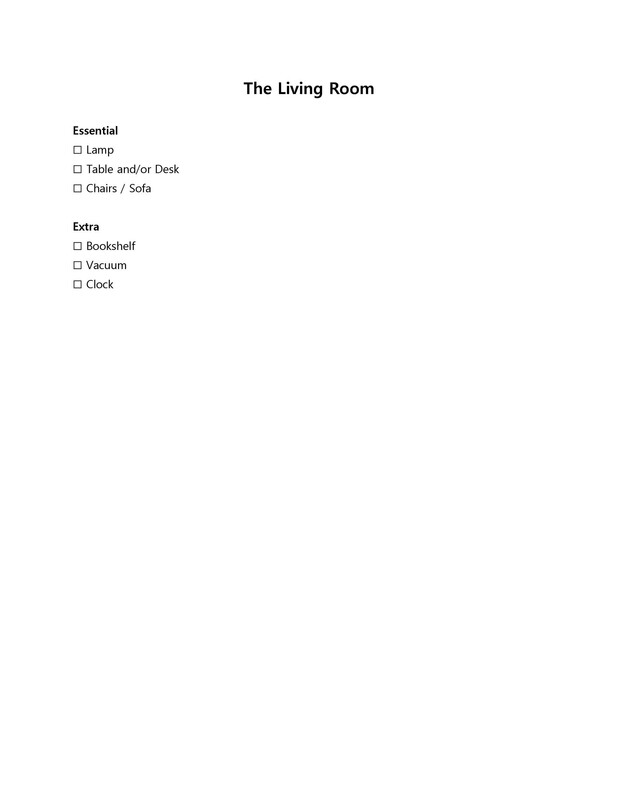 Items could include lamps, coffee tables, bath mats, dinner sets, and tools. Choose only those that you will need in pursuing your course. Cross out the rest. 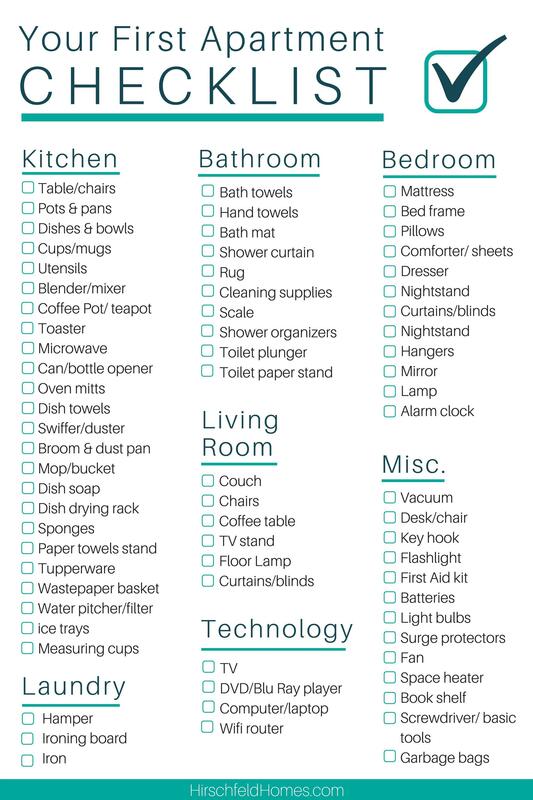 Eventually, you will end up with a list of only your basic needs. A third of your life is spent in bed, on a mattress. It is essential that you have comfortable sleeping hours, a time for the body to rest and recuperate. Buy a decent mattress will make you feel rejuvenated. Feeling so, you’d enjoy the day more, especially your new apartment. Sleeping on the floor without a mattress is as bad as sitting on the floor without a sofa. This is somewhat an expensive item so you can either scout around for a new sofa as your budget would permit. Or you can drop in high-end garage sales. A little patience driving around could get you a very expensive sofa at a very low price. Bed frames can be called an accessory to a mattress but it will make you feel more like an adult. Could you imagine having a date and all you have to show is a mattress? Have class, go buy a bed frame. If you are a fast food junkie, there would be no need for kitchen stuff. Just a glass and a plate will suffice an imbecile’ needs. However, if you are into cooking, healthy or chef wise, a few pots and pans will be a good investment. If you cannot afford it yet, try to get them from home or from friends or again, from garage sales. Pretty embarrassing to have guests eating on paper plates and drink on paper glasses. These items are not that expensive. Go ahead and get some. You can pick some that are simple and still of high quality. With care, you can be using them for years and eventually will turn out cheaper than the constant purchase of paper plates and cups. Working seated on the sofa could give extra strain on your back. It is also very uncomfortable. Although these days, desks are not that utilized anymore in the presence of working tables, they still could provide better comfort for working people. So if you have some more to spare, get a desk with a comfortable chair to boot. The overhead lighting provided by the apartment is almost always inadequate, painful to the eyes. Substitute this with some good lamps which could be bought at reasonable prices. Again, you can visit your second stores for availabilities. 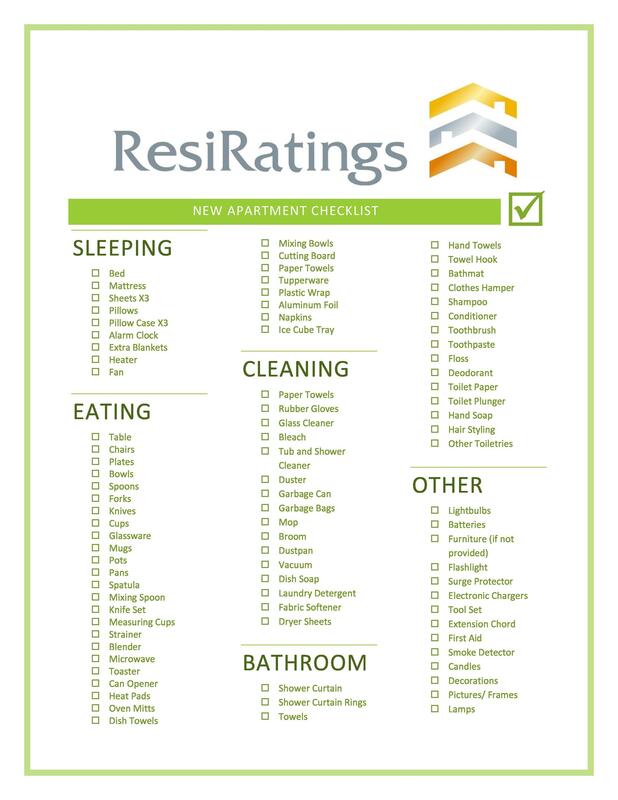 Not really in the same category as mattresses but they do provide comfort and convenience. In case you are still short to afford these items, use cardboard or wooden boxes covered with tablecloths for a better presentation. Meantime, scout garage sales or antique stores to find maybe some surprises. Rugs can spell the difference in the look of a room. But great rugs can sometimes be expensive. This item is relegated therefore as a buy later item. Another candidate for the buy-later list. Depending on one’s taste, the apartment could be decorated with affordable art whether is be paintings or sculptures. 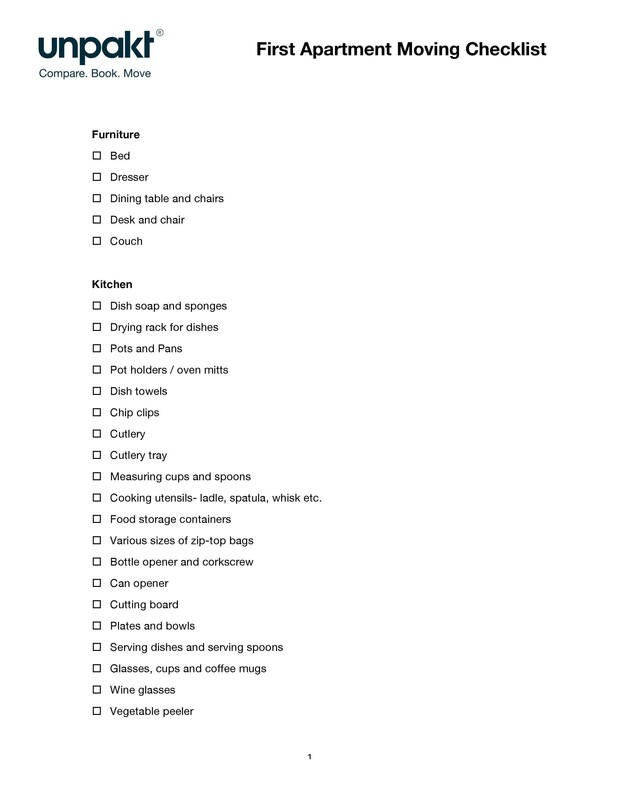 Unless you are into regular entertaining of guests, these items need not be a priority in your checklist. Another candidate for the buy-much-much later list. Go buy a better mattress instead. Again for party maniacs and definitely not advisable for the moment. Get a small table with two chairs. That should be good enough to have a meal on. Avoid unnecessary expenses on dressers and the like. At this point in furnishing your apartment, you already should have an accumulation of boxes which could serve as storage bins. 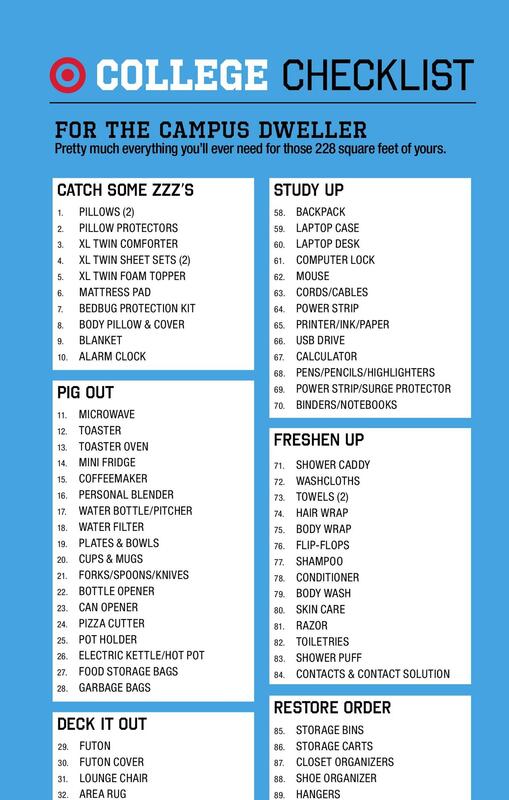 Remember you are a freshman and saving is important. 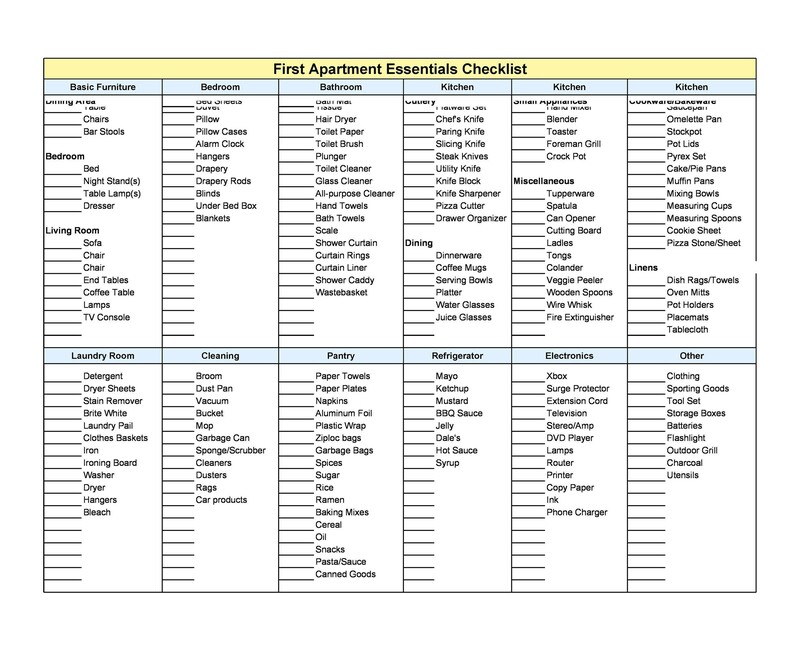 It is essential to pinpoint in your first apartment checklist items that are not of priority, those that you can do without. At some point in time, later on, you may be able to afford some of these. Then you can start to accumulate but still have to prioritize which of such have the more contribution in the apartment. 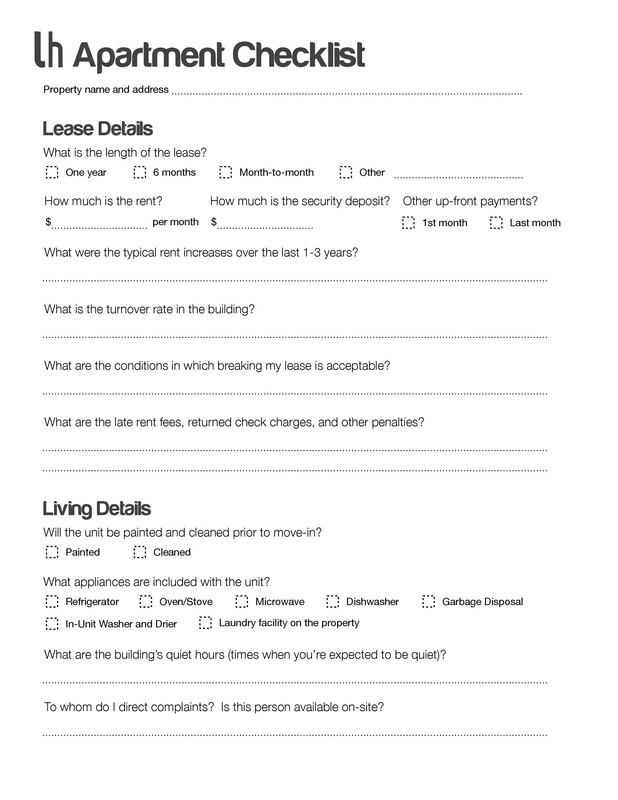 Read your current lease so you would be acquainted with the proper protocol on informing your landlord when you will vacate the premises. 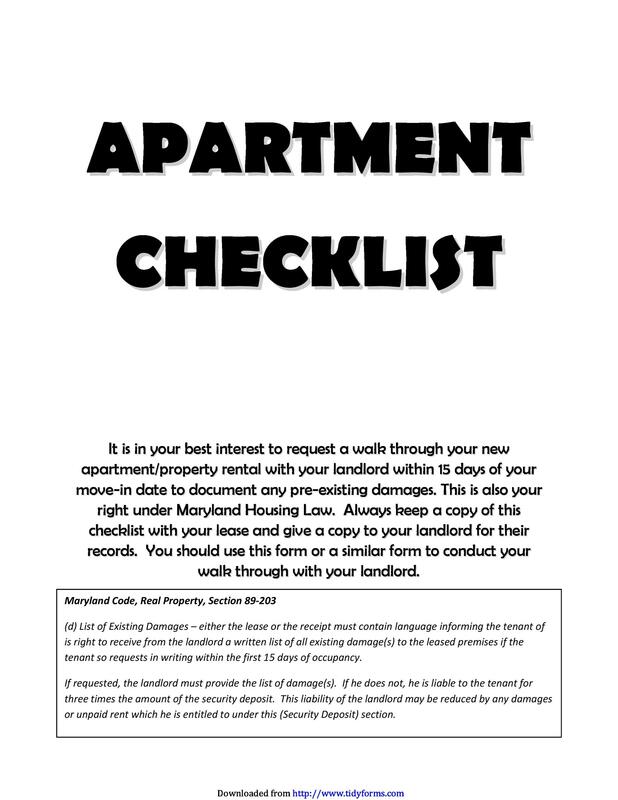 There usually are directions for this: most landlords would require a signed document one month before you leave. This will give the landlord time to take photos and list the property to attract new tenants immediately. 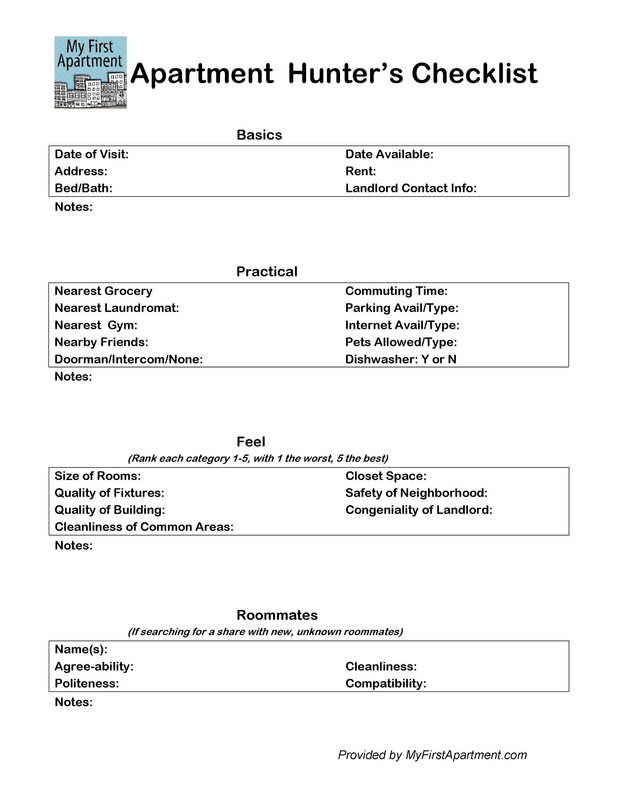 Research for moving companies if you plan to hire professionals, look at reviews and ask acquaintances for reference. Compare prices. 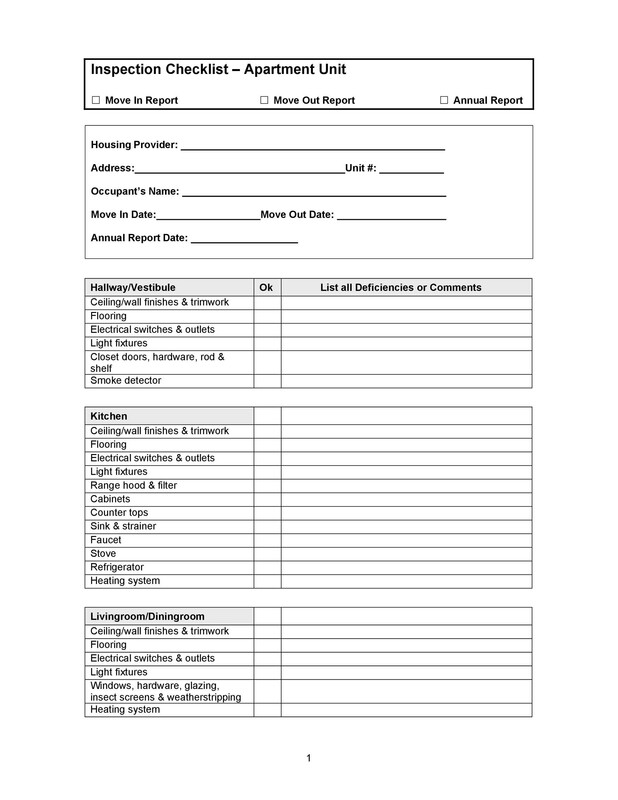 Most probably, you will have to schedule an in-home estimate so mark that to your calendar. 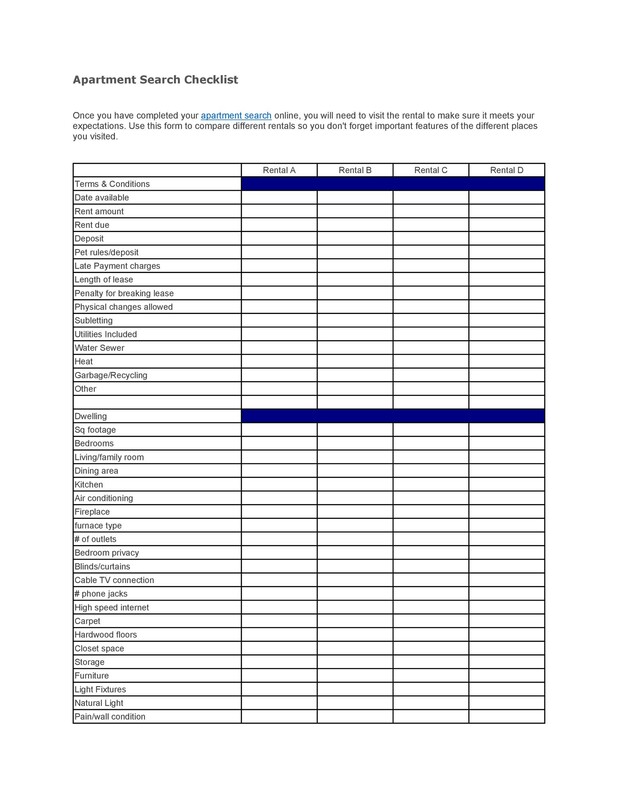 Schedule a date with your moving company of choice. 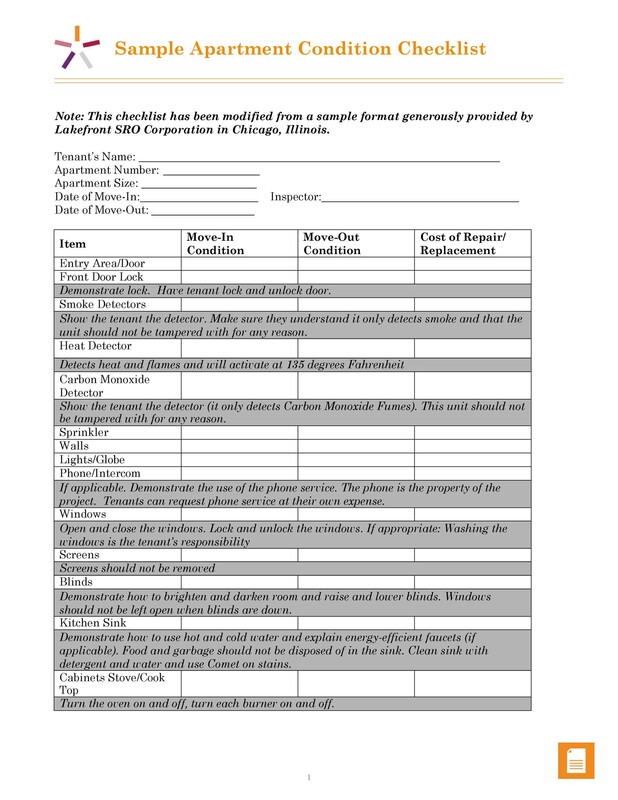 Get a written confirmation of your moving date and itinerary. Devise a moving budget which will include the cost of movers. Inform the proper authorities of your move: your children’s school, doctors, employers and groups you belong to. Start accumulating supplies like boxes and packaging tapes. As the moving date nears, you should be delving now on the moving tasks. Some of your items the moving company may not be able to deal with. Make other arrangements so these could be moved to the new place. Start sorting your stuff. Get rid of things you do not need. Some stuff may not fit your new apartment. Sell it or donate it. 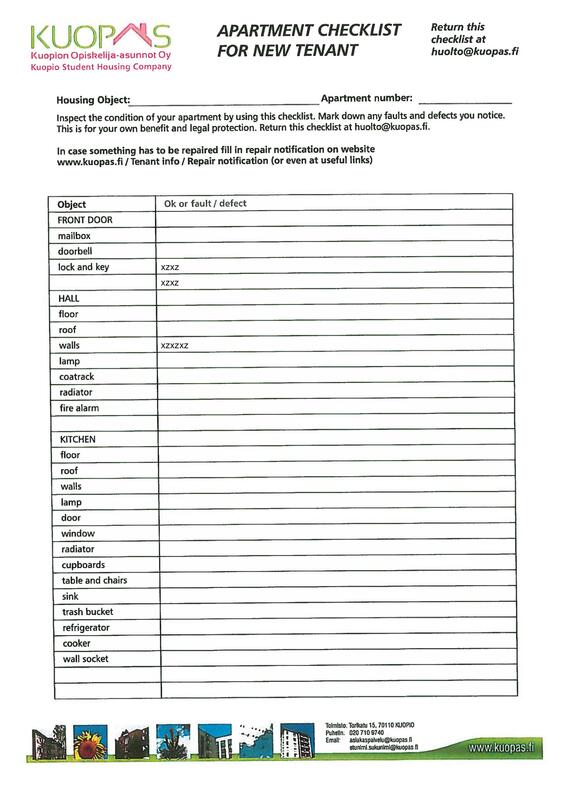 Fill out the change of address form provided by the postal service. Schedule cancelation or transfer of utility services: gas, electricity, internet or cable service. Ensure you get some time off work if needed. Get vehicle stickers for the new location. Arrange for any temporary storage. Start using perishable items you don’t plan to move. Have a garage sale if your landlord would allow it. A little extra money would help from items you won’t keep. Return library books or DVD rentals. 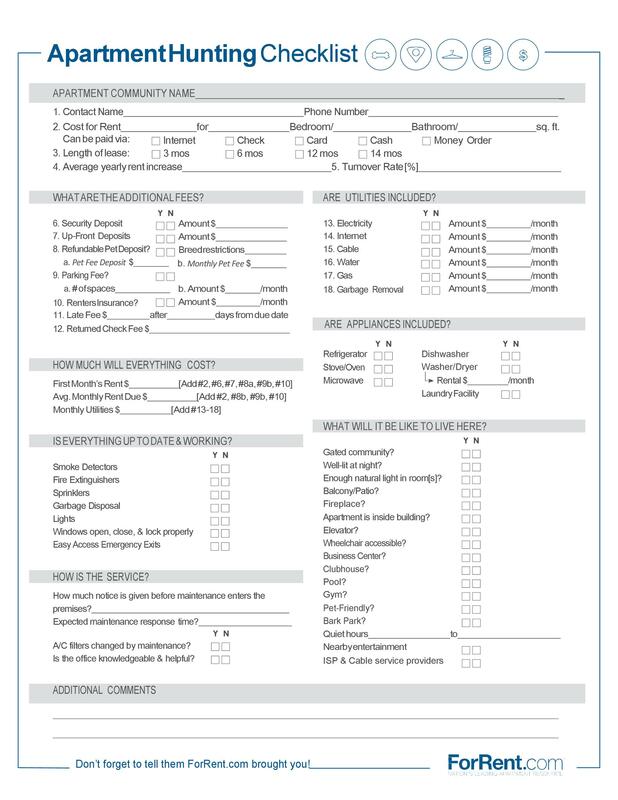 Finish making an arrangement with the utility companies and re-confirm your date with the movers. 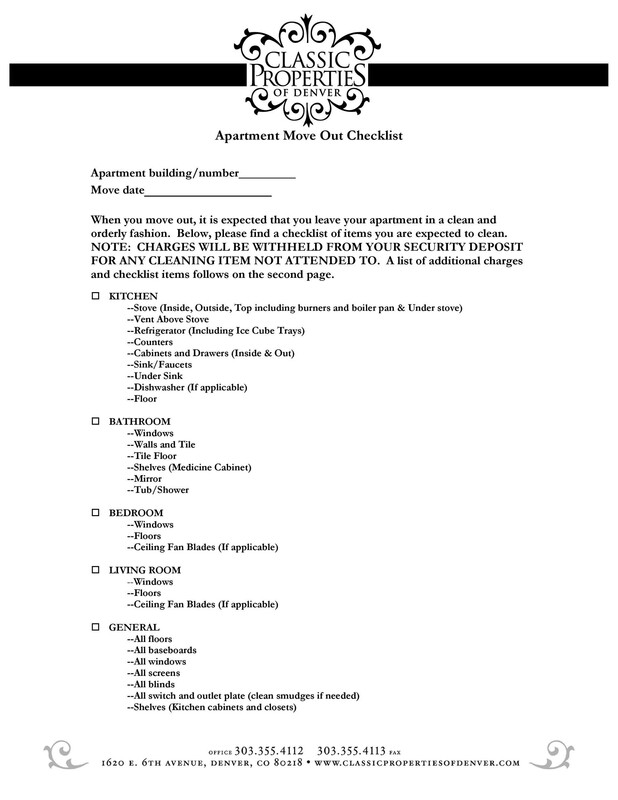 Inspect what cleaning is required in your lease and schedule a cleaning day. Finish packing. Label each box with its contents. Consider packing by room so that unpacking would be easy. Ex: Kitchen box for kitchen items. 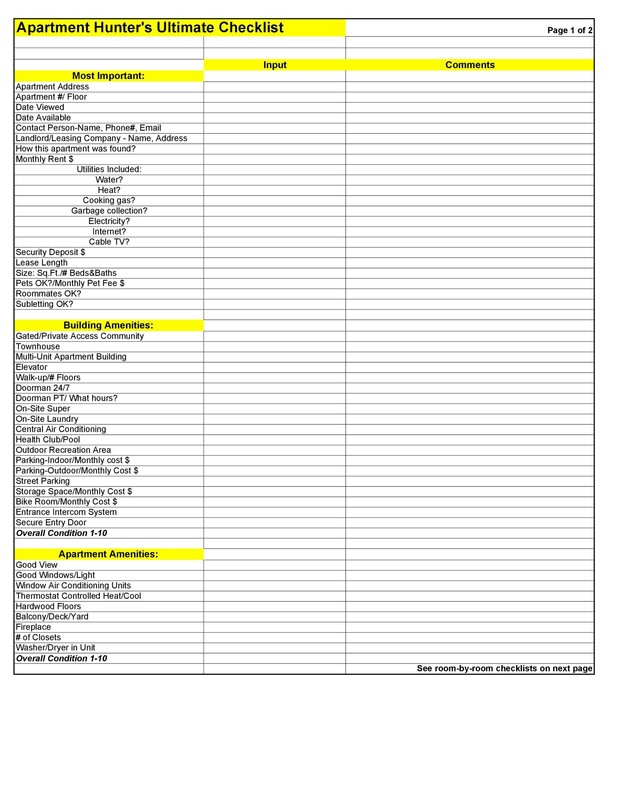 Make an inventory of all the boxes. Number them if necessary. This will ensure that you have everything after you move. Pack one (1) essentials box that has everything you need for your first night in your new place. Fill a cleaning supply box. You’ll need this to clean your old place before you turn over your keys to the landlord. Confirm plans for pet and childcare. Confirm the installation date of new utilities: internet, gas, utilities. 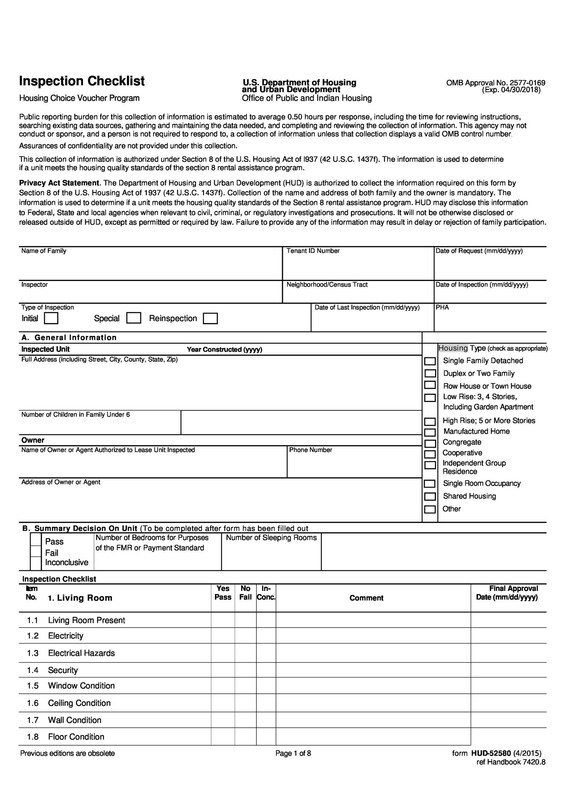 Confirm details of your moving day with your moving company. Withdraw any cash you’ll need for the moving day such as money for ordering food and/or money for the helpers. 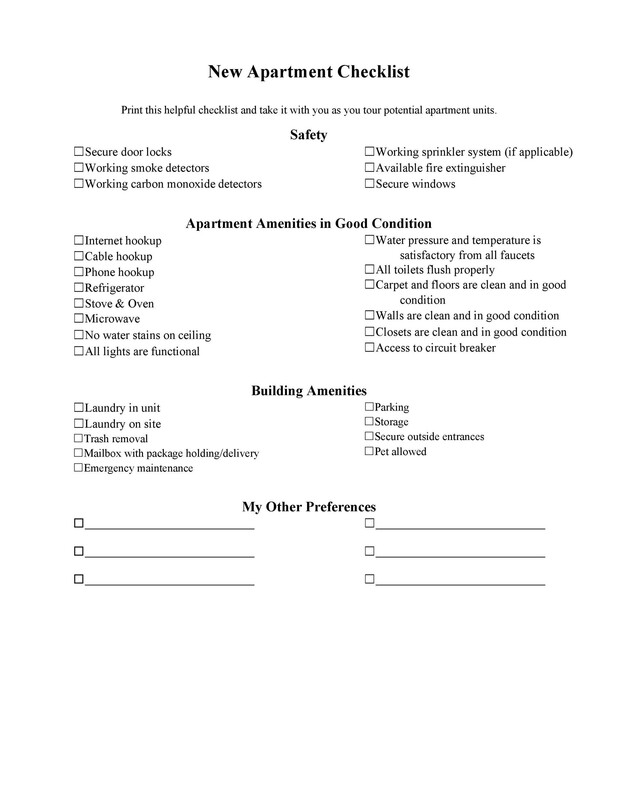 Clean the old apartment to the required specifications. 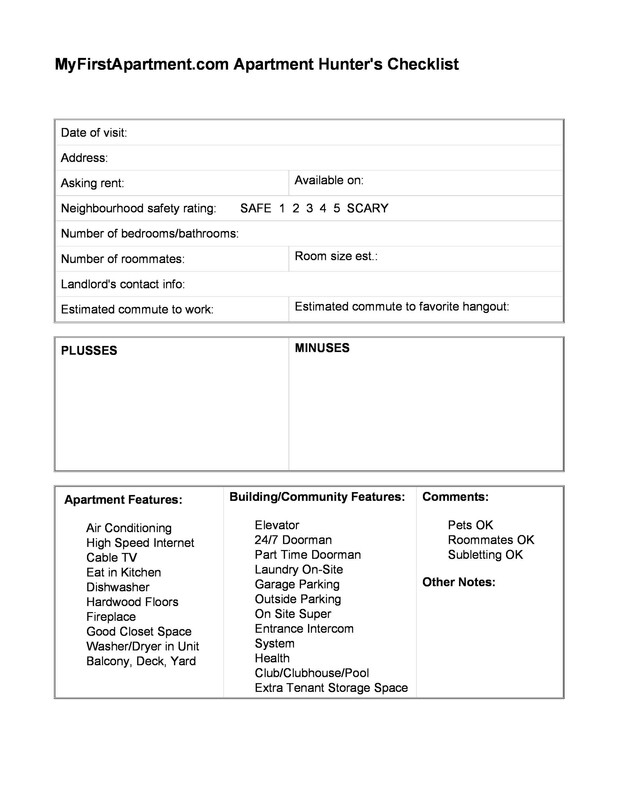 Schedule a walk-through of the old apartment with your landlord. Skipping this would forfeit your ability to argue with any security deposit decisions your landlord would make. 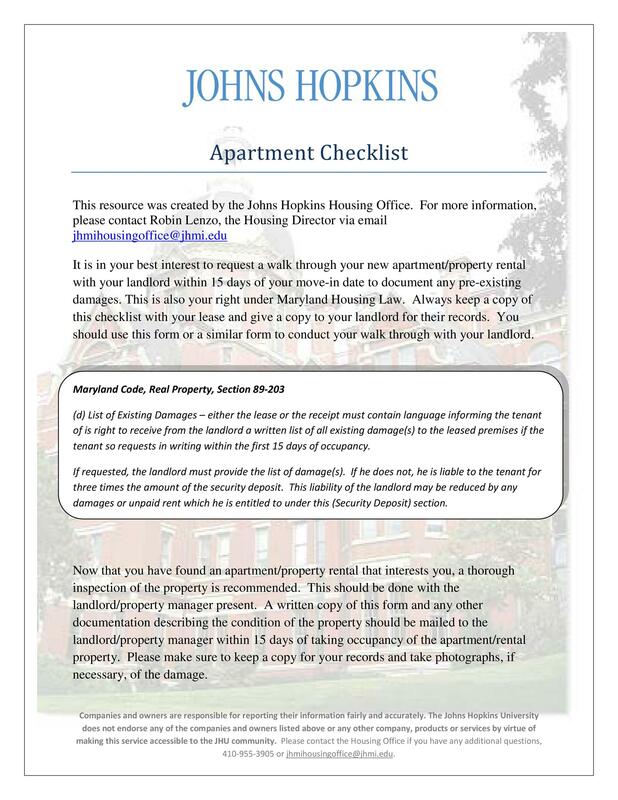 Your presence is required to pinpoint to the landlord of what is and is not your fault. Request your landlord if you can reserve a parking spot for the moving day. 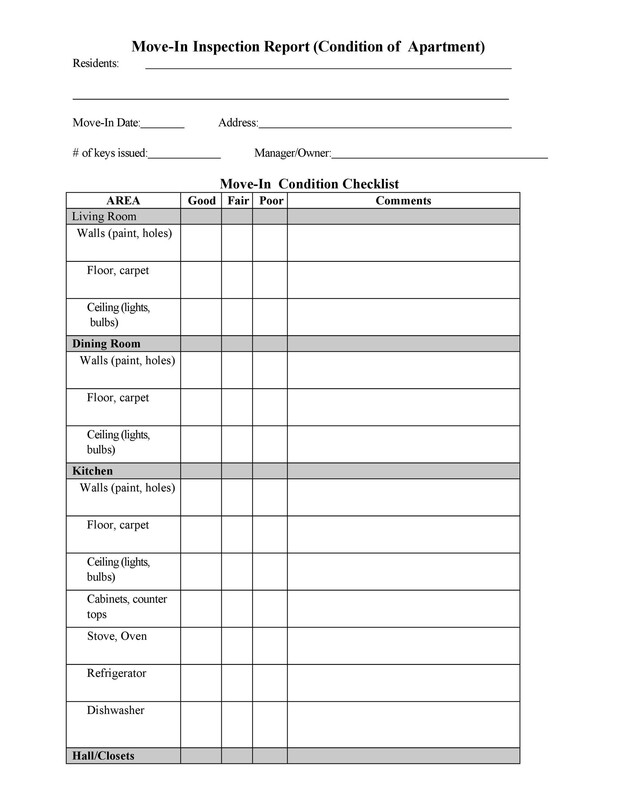 These chronological details will certainly help you facilitate your moving details. 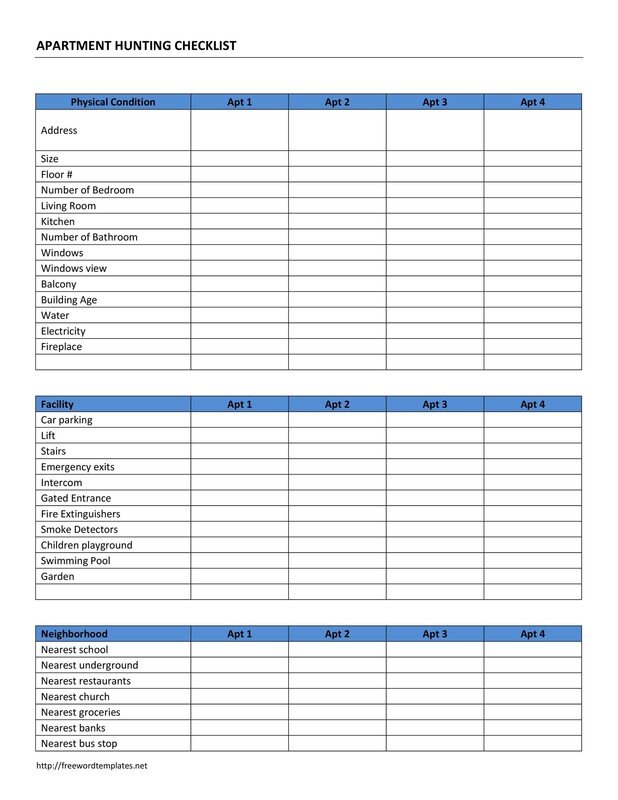 Ultimately, an organized timetable will prove beneficial to your moving goals. 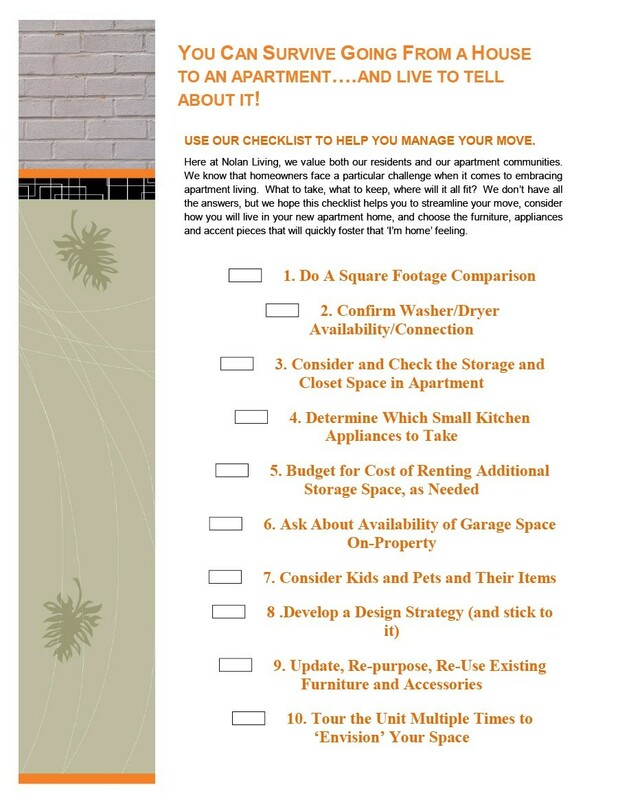 A new apartment checklist would contain a lot more information, especially if you’re moving with your whole family. 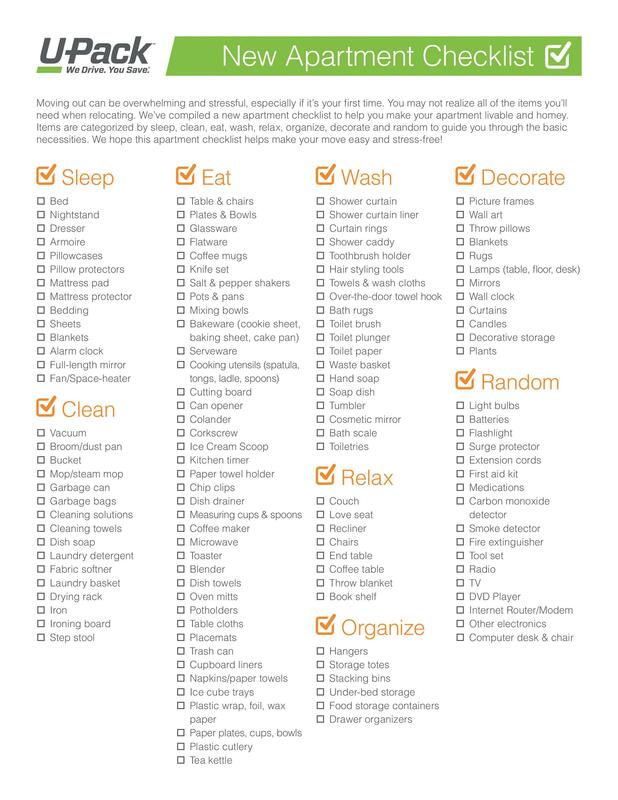 Now when you’re a student who is moving out for the first time, your checklist may be more simple. 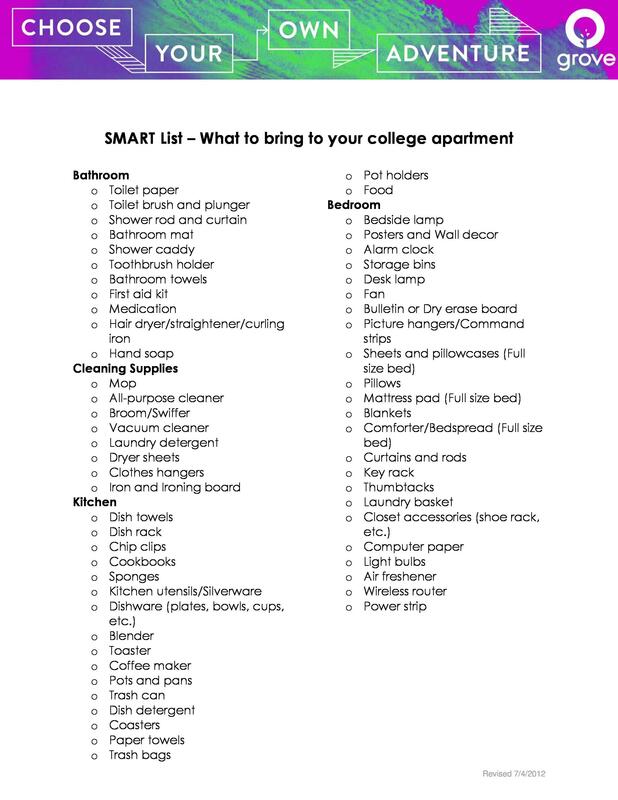 Preparing yourself on what to pack on your way to college shouldn’t be a burden. As stressed often enough, bring with you the basic necessities. 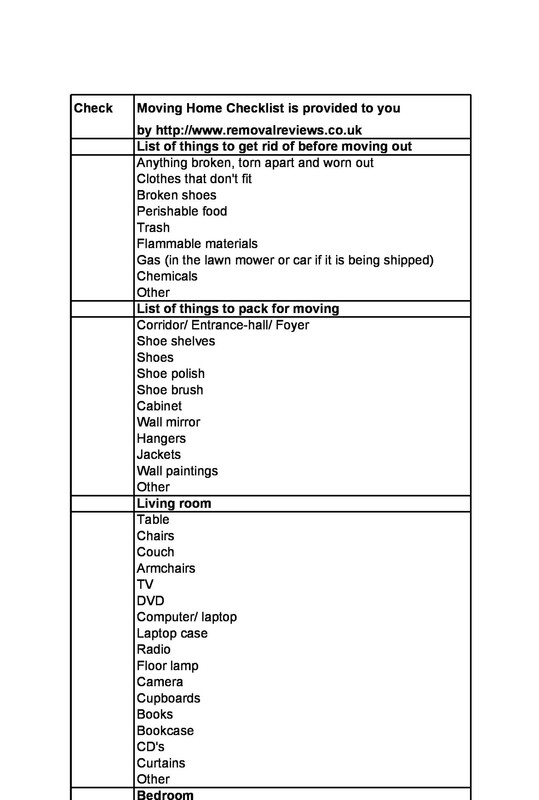 Because of apprehensions, you might be packing so much stuff only to find out later that you don’t really need so much or that some items are rendered unusable because of space constraints. Your own private quarters. Other spaces are shared between you and other roomies but your bedroom is provided with a door which you can close and can make you focus more on your studies. You may only have one bathroom for a group of roommates in your college apartment. 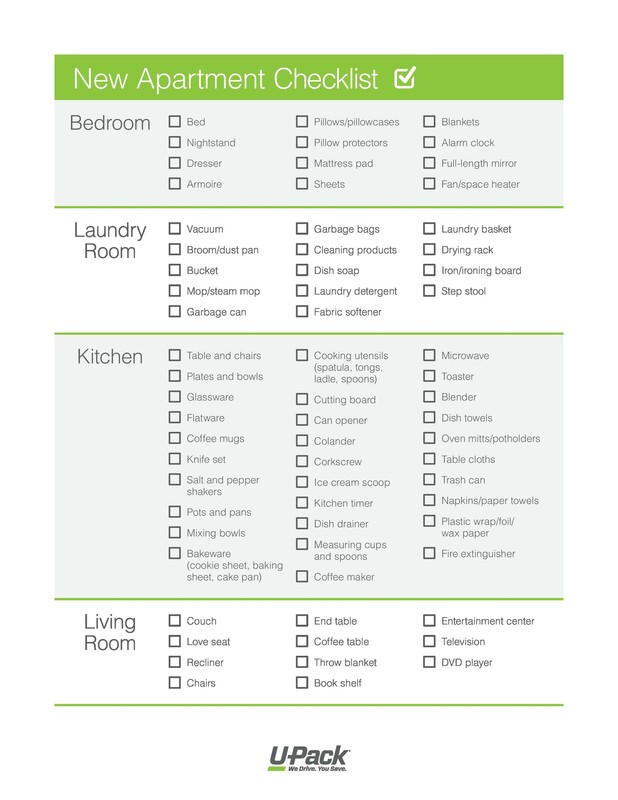 Essentials include anything that helps you manage clutter and keep your roommate’s stuff out of your area. 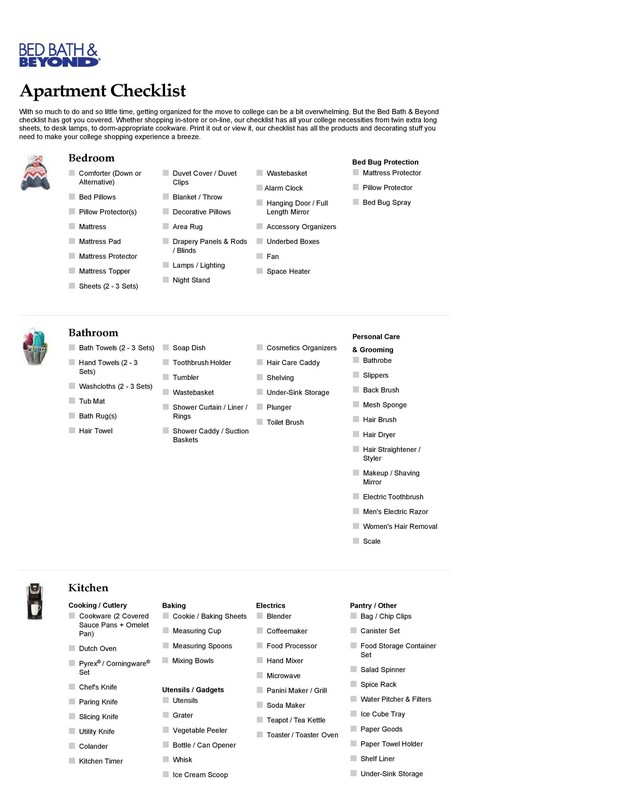 Decide among your roommates who will bring what items for the kitchen. This could mean savings but remember along the way, what you don’t buy now you may need later.